In the "Talking Back: Letters From Readers" section of the new issue of Vogue, there are two, yes two letters regarding the controversial LeBron James/Gisele Bündchen cover. We read them this weekend, and the folks over at The Fashion Bomb have already posted them. The first is from Christine Fox of Santa Ana, CA: "I'm an African-American women who sees nothing wrong with the April cover. I know there has been a lot of buzz about it, and folks are outraged, but it's ridiculous!" Her letter goes on to say: "It is just fashion, dahling." The other letter, From Stephanie Jackson in Brooklyn, states: "The April cover bothers me. More devastating than the perpetuation of stereotypes in mainstream culture is the dismissal of the counterargument as if it doesn't make sense. If controversial imagery rubs a minority group the wrong way, shouldn't the appropriate response be an apology?" Anyway, as if to prove that the magazine is part of the solution and not part of the problem, this same issue of Vogue has a story called "Is Fashion Racist?" 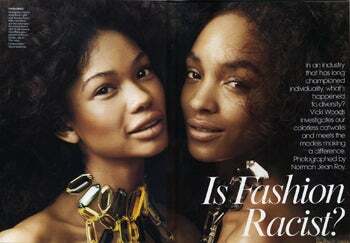 The piece has "interviews" with models Chanel Iman, Jourdan Dunn and newbie Arlenis. See? Vogue is not racist — some of its best friends are black! The funny thing is that the editorial "proof" that Vogue embraces black models — a single page highlighting their appearances in the magazine — has, as its most recent usage of a black model a 2006 shoot with Liya Kedebe. Two years ago! The most recent cover on this page? Kiara Kabukuru, in July 1997. In any case, we'll have more to say about this when the "black model" issue of Italian Vogue hits stands, but here's a question: If Vogue is the leading fashion magazine, should the question "Is Fashion Racist?" actually be "Is Vogue Racist? "?